Tattoo - ACE Peripherals ::: Completing I.T. In a few seconds, Tattoo personalizes in monochrome or colour your pre-printed or blank plastic cards. With a 300 dpi standard resolution and ‘near-to-edge’ printing, Tattoo prints pictures, texts, barcodes and logos as required. Tattoo fully addresses the specific needs of small organizations that print badges in low volume or just once in a while: sport clubs, SMEs, retail outlets, schools, libraries and local authorities. It is ideal for membership cards, subscription and loyalty cards, badges for visitors and employees and much more. Go badge, print yourself! Both the printer and the software have been designed with user needs in mind. Tattoo is therefore very easy to install and to use. 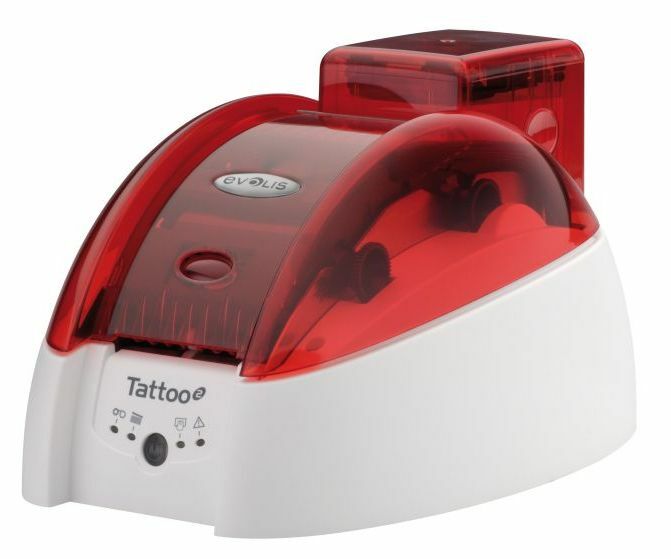 Tattoo is the most compact printer in its category ! It can fit in any location. Easy to carry, it is also ideal for over-the-counter and itinerant applications. Tattoo is the perfect solution for small businesses and organizations which require occasional and small batches of prints: a low initial investment, a premium quality and a competitive ribbon offer. Expedient for both monochrome and color printings, Tattoo offers a variety of options and accessories in order to match all requirements. Tattoo benefits from the Evolis' know-how and quality standards in terms of reliability and robustness.